Dr. Levy has secured the field’s top experts to offer the latest clinical reviews on cholestatic liver disease. The issue will include articles devoted to The Gut-Liver Axis; Update on Genetics in Primary Biliary Cirrhosis and Primary Sclerosing Cholangitis; New thoughts on IgG4 Associated Cholangitis; Cancer Risk and Surveillance in PSC; Novel Therapies for PBC; and Liver transplantation for Cholestatic Liver Diseases, to name a few. 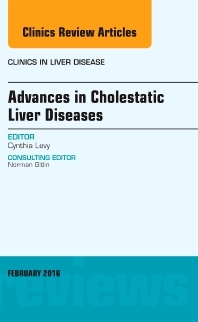 Dr. Levy’s issue will be the most current authority on cholestatic liver disease.